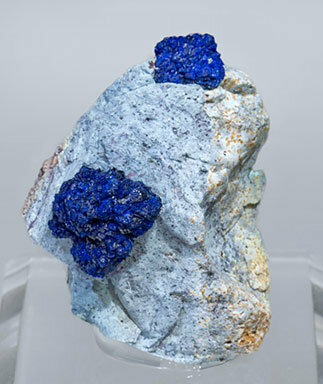 Two nodular clusters of small crystals with a very vivid and uniform color. On a rocky matrix. 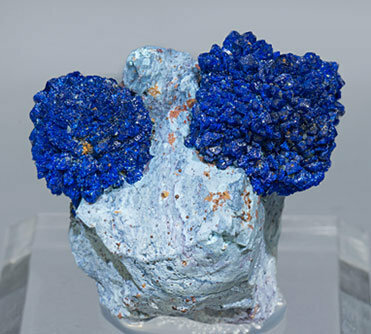 Nodular clusters of small crystals with a very vivid and uniform color and with small Malachite coatings. On a rocky matrix. A novelty at Tucson 2019. 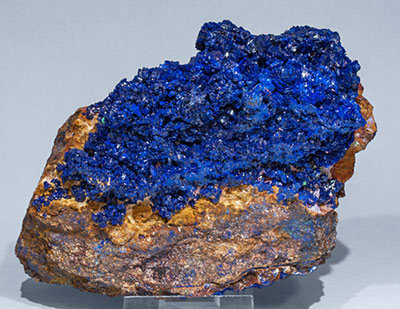 Very sharp Azurite crystals with a morphology that has been unusual until now at Milpillas. 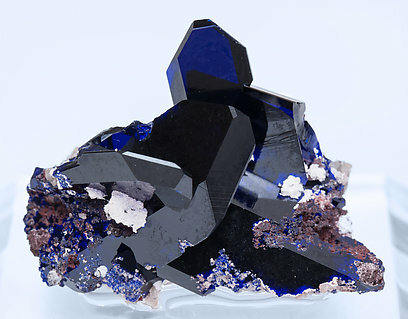 The crystals are on matrix and some of them are totally or partially doubly terminated. 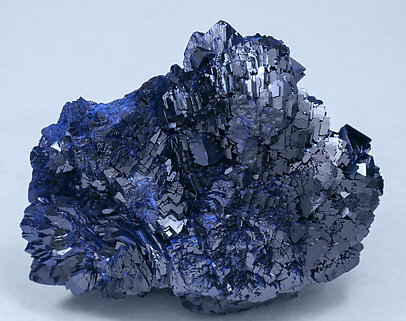 Between translucent and transparent, extraordinarily bright and they have a very deep color with vivid reflections. Floater aggregate with rosette growths of tabular crystals with very well defined faces and edges and quite large for the locality. 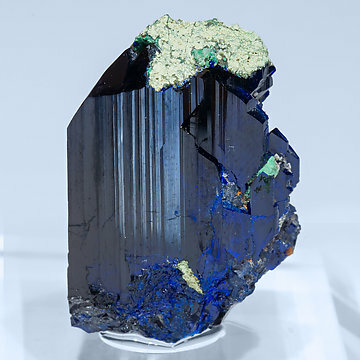 It has an intense and deep blue color and has a small spherulitic microcrystalline Malachite growth. A French classic. 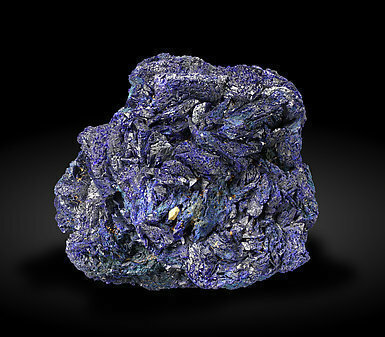 Floater aggregate with rosette growths of equant crystals with very well defined faces and edges and with an intense and vivid blue color. 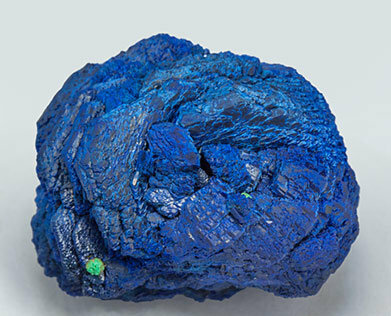 Floater growth of very sharp equant Azurite crystals that have the false appearance of cubes. They are bright and have a very vivid color. 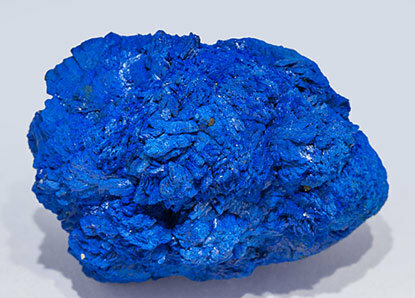 Complete floater of very sharp tabular Azurite crystals that are very bright and have a deep and vivid color. The sample is from recent and surprising finds at the old dumps area at Chessy. 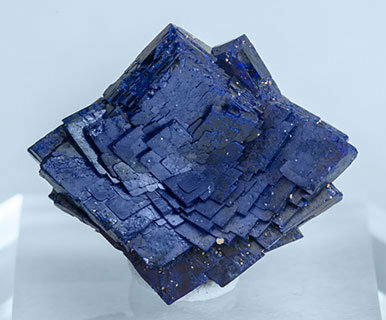 Rosettes, on a rocky matrix, of tabular crystals with a very vivid blue color. An American classic. 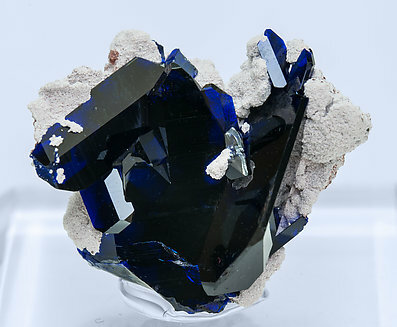 Group of very sharp and flattened crystals with the dominant faces of a rhombohedron, with very well defined faces and edges and a clearer color than usual for the Chessy pieces. The sample is from recent and surprising finds at the old dumps area at that mine. 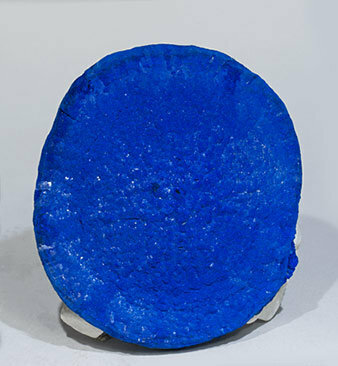 Group, on matrix, of lenticular crystals, one of them clearly dominant, with very well defined faces and edges, bright with a color that is intense, very much more vivid than usual for the locality. 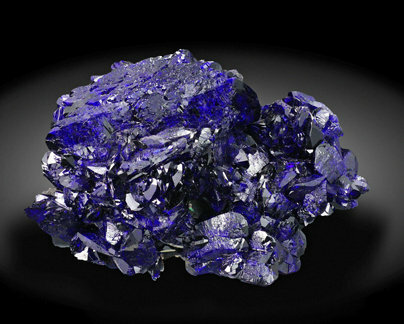 Floater aggregate of tabular crystals with sharp faces and edges and a very intense blue color, with silky reflections. A good French classic. Group of very sharp equant rhombohedral crystals with a more vivid color than usual for the Chessy pieces. The sample is from recent and surprising finds at the old dumps area at that mine. 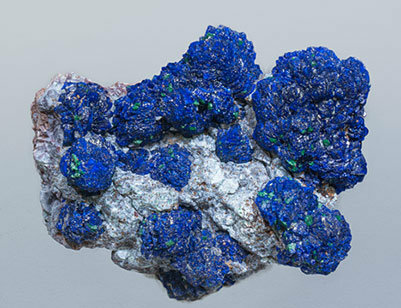 Complete flattened Azurite nodule on matrix. It’s contour resembles a medallion, a shape typical of the locality, with diffuse rosette growths on its surface and a very intense and uniform color. 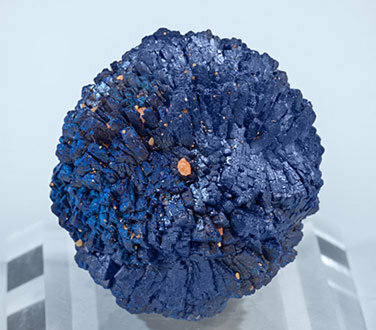 Due to the intensity of its color and the excellent definitions of the nodule this sample is better than usual for the locality. A novelty at Tucson 2019. 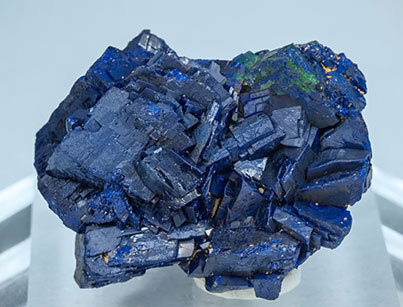 Very sharp Azurite crystals, one of them clearly dominant, with a morphology that is unusual until now at Milpillas. 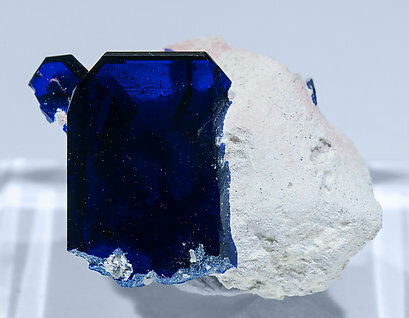 The crystals, on matrix, are extremely flattened, between translucent and transparent, extraordinarily bright and have a very deep color with vivid reflections. 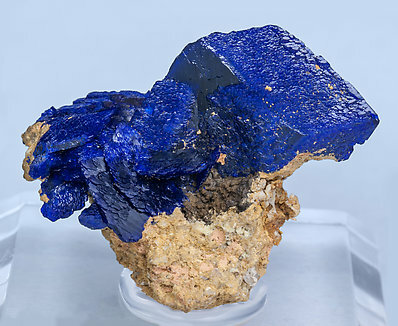 Growths of very sharp Azurite crystals that are very bright and have an extraordinary color, very vivid, and are on a limonite matrix. Among the best known for this mine. A novelty at Tucson 2019. 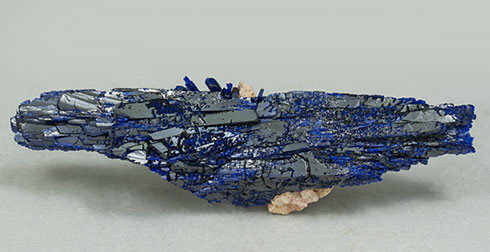 Very sharp Azurite crystals with a morphology that is unusual until now at Milpillas. 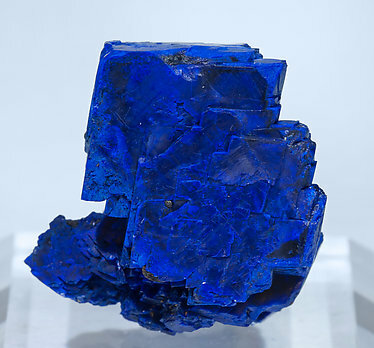 The crystals, on matrix, are very flattened, between translucent and transparent, extraordinarily bright and have a very deep color, with vivid reflections. 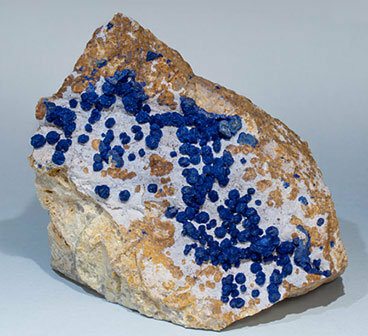 Botryoidal and spheroidal aggregates of small rhombohedral crystals that are bright and have a very vivid and uniform color. A French classic of great quality. 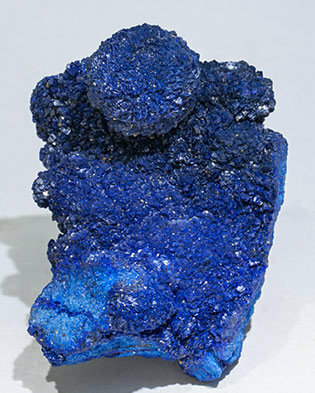 Single Azurite crystal on matrix. 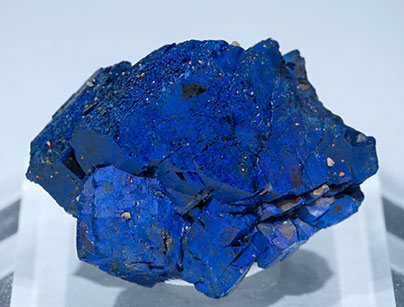 It is doubly terminated, very rich in faces, very bright, and with the extraordinary deep blue color (electric blue) that has made the Azurites from this locality famous. Floater group of rosette growths of flattened crystals that are very bright with a very vivid color. The sample has an extraordinary quality for the best well known at the locality. 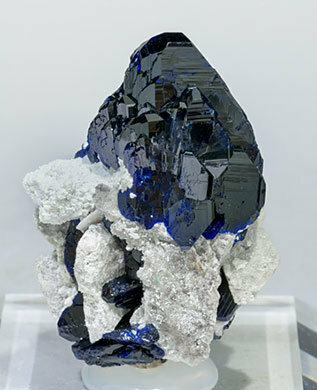 Polycrystalline growth of crystals, one of them clearly dominant, very rich in faces and on matrix. 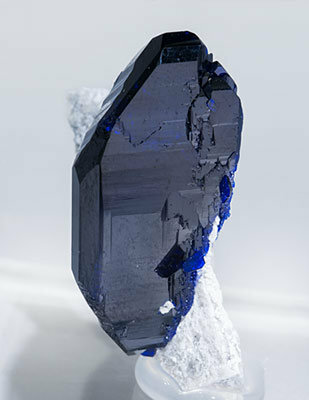 The crystals are very bright and show the extraordinary deep blue color (electric blue) that has made the Azurites from this locality famous.